We returned home from a week in Maui yesterday afternoon and couldn’t be more excited that March is finally here! It made returning home so much more bearable. Once March rolls around each year, I feel like winter is officially over and I can set my sights on spring and summer! 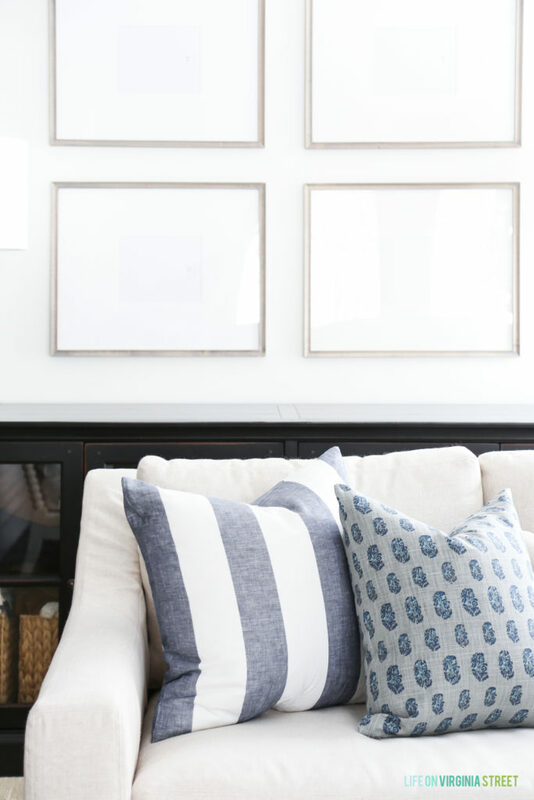 Today I’m sharing my first home tour of the year, hosted by my sweet friend Bree at ZDesign At Home as part of the Decked and Styled Spring Home Tour series. If you’re stopping in from A Thoughtful Place, welcome! I absolutely love all the updates Courtney has been making to her new home. 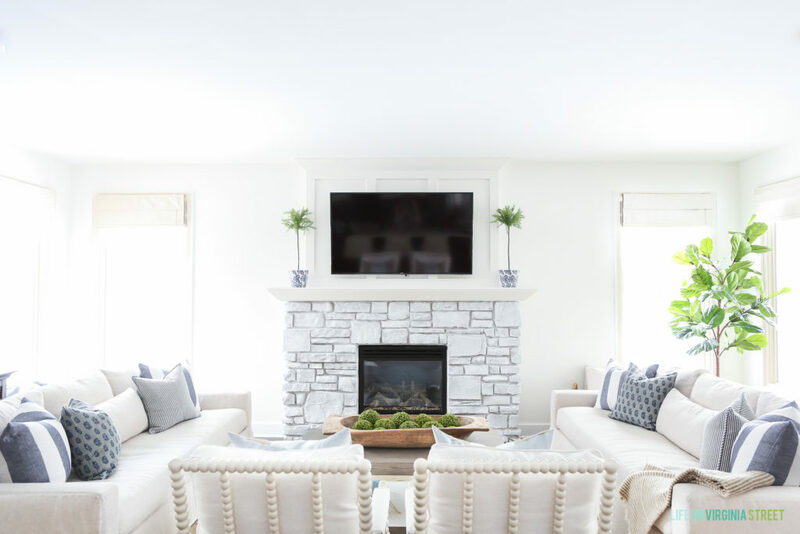 My spring updates are very simple this year; small changes to make the spaces feel fresh and new for the changing season. 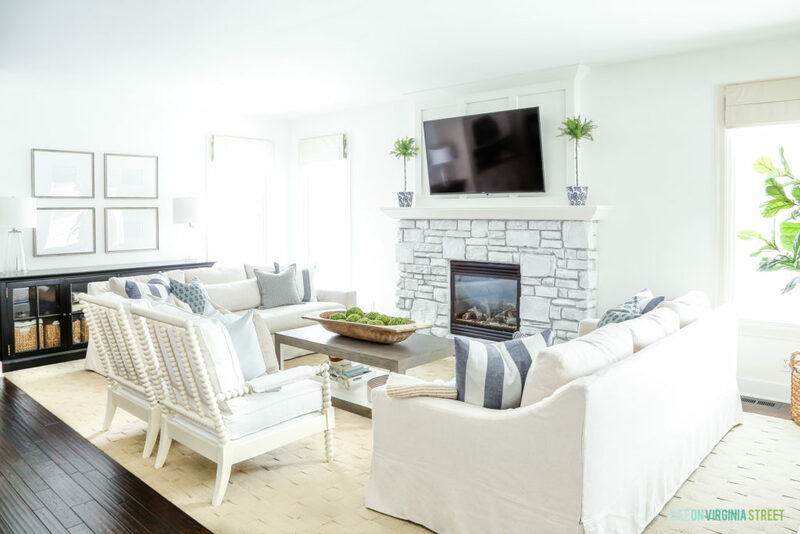 Welcome to our blue and white spring home tour! 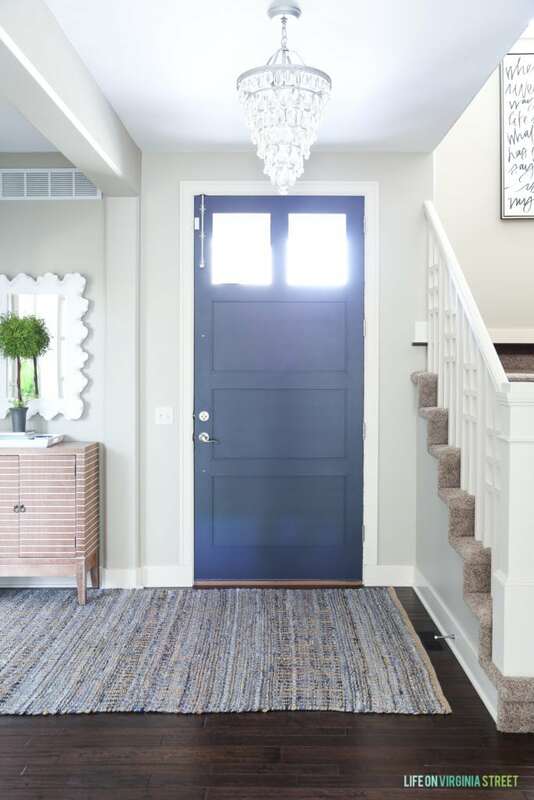 I recently updated the rug in the entryway from the graphic striped version to this more subtle woven rug. I’m not sure it will stay here permanently, but I love the colors in it and it’s perfect for hiding all the dirt and slush that gets tracked in this time of year as the snow melts. 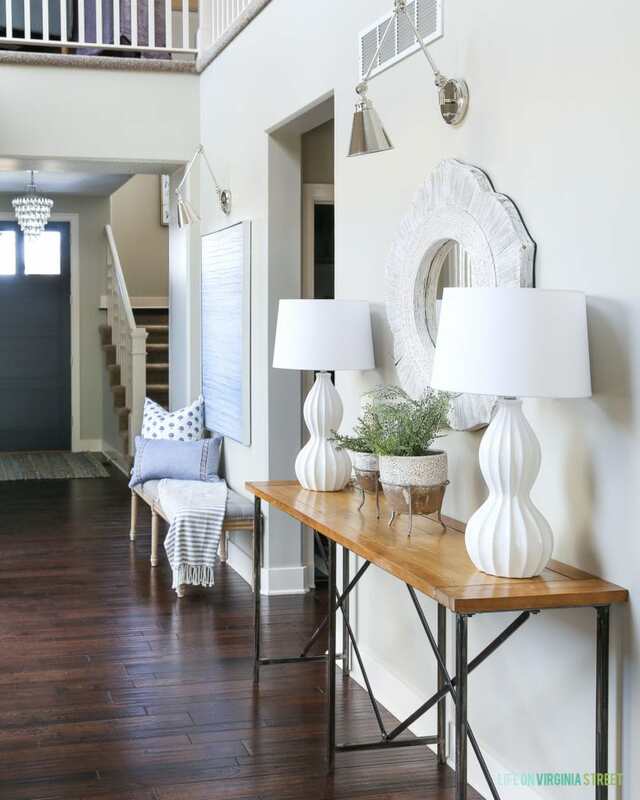 One of my favorite things about this time of year is the extra sunlight that streams into our entryway. It’s definitely a sign that warmer weather is on it’s way! I recently found this oversized artwork at HomeGoods, and it’s exactly what I had been needing for this spot in our entryway hallway. I’ll never get over all the great light we get in this hallway that overlooks our courtyard. It’s definitely one of the main reasons we bought this house! Our frames have the 8×10 opening (which I believe may have since sold out), but these frames are nearly identical. I’m excited to pick the artwork or photos for the frames, but I’m trying not to rush the decision! This time of year, I’m getting extra excited about my decision to take the walls from Behr Castle Path to Benjamin Moore Simpy White. The room literally glows when the sun is out! I’m loving this new view from our kitchen island. Now that the leather chairs are gone and I can look at the pretty backs of our spindle chairs, the view is so much better! I’m hoping share the review of our new sofas later this week as well! Bottom line – we love them! I’m also loving our faux fiddle leaf fig tree in this corner in our living room! Last week I shared my Easter tablescape, along with some updates to our dining room. I bought the artwork here when I bought the art in our entryway. It was definitely a good day at HomeGoods that day! If you love our reclaimed hutch, you can read about it here (along with several alternatives). These gingham plates are my new obsession! I can’t wait to use them all spring and summer long! 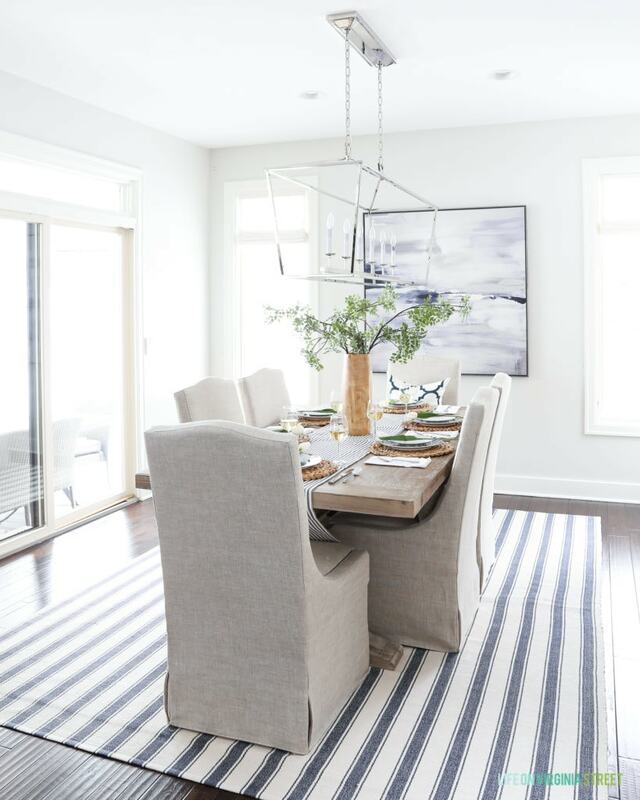 I also recently shared details on the best knock-off Darlana pendant lights because so many of you love our dining room light, but not the price tag that accompanies it. I hope you enjoyed the first part of our blue and white spring home tour! 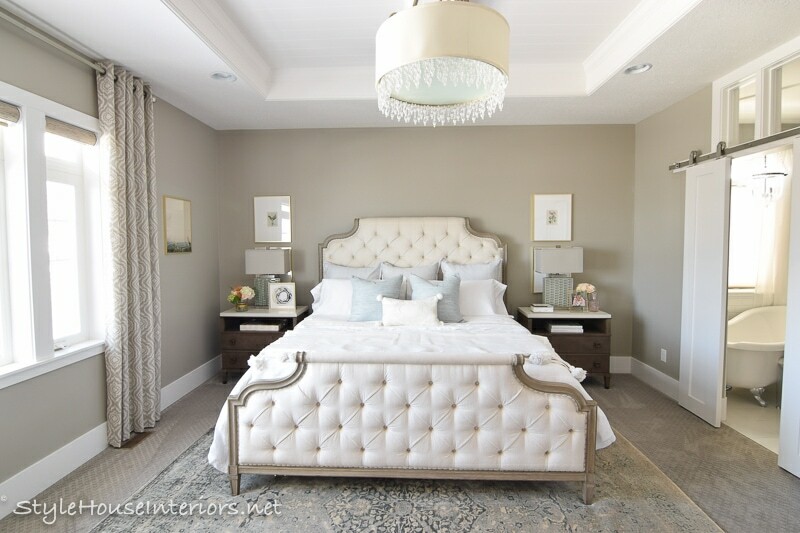 The next stop on the tour is Jen from StyleHouse Interiors. Jen has such gorgeous style and her home is unbelievably beautiful. I know you’ll love it! Be sure to check out all the other stops on the tour below! They all happen to be some of my favorite bloggers for the best inspiration! Everything looks so clean, fresh and inviting Sarah! I so want to come back! Our time together at your awesome home last summer was so wonderful! A time none of us will ever forget! Sarah every time I see your home my jaw drops. It’s so clean, fresh and beautiful. 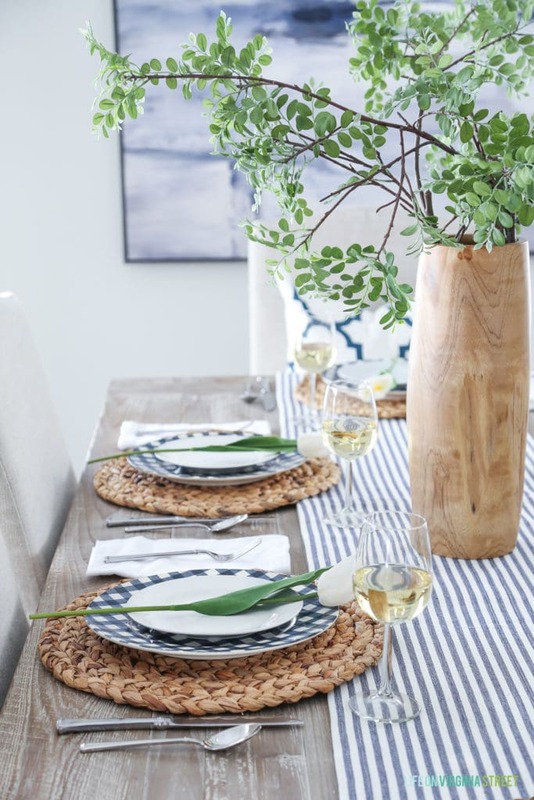 Love all of the blue and white and your Spring touches. So enjoyed the tour, my friend. Wow, Sarah! You never disappoint. Your home looks stunning. I love the furniture changes in the living room as well as the new, large art piece in the entryway. Beautiful tour. Absolutely obsessed with both pieces of art from HG. Amazing finds! WOW! 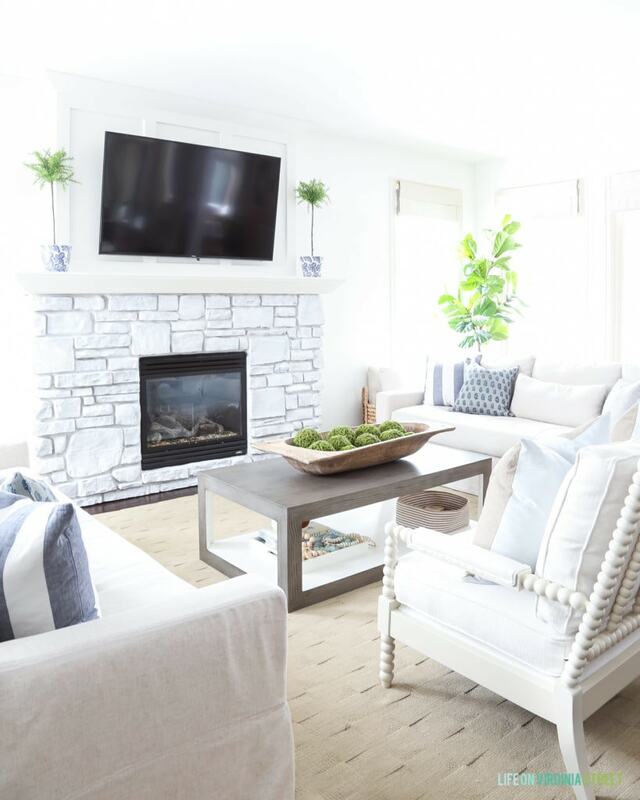 I love the new sofas and the blue and white stripe table runner. You have a beautiful home!! I love how you come up with a theme (perhaps because that’s how I roll too!) and follow it through each space. Oh my… I love, love, love both of the artworks you found at Homegoods! Great finds, and such a beautiful tour! Very fresh and airy! Would you provide the direct link to the denim-blue pillow with the darker blue border? Love it but the link goes to 92,000 pillows! Thanks much! Gorgeous as always! 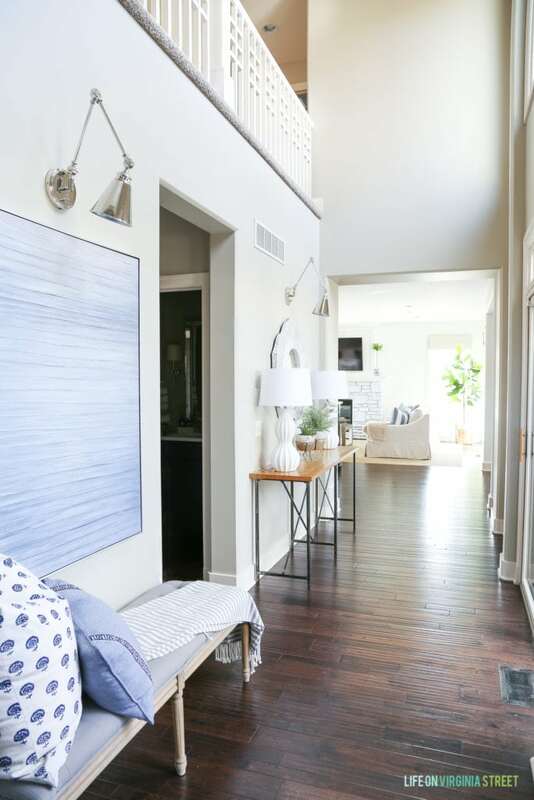 Love following along on your home tours! Your pieces are so well presented and outlined for an interested reader such as myself. One quick query, that lovely hutch in your dining room – Where did you get it? (My apologies if it is explained somewhere). Thank you! Here’s a detailed post on our hutch if you want to check it out: https://lifeonvirginiastreet.com/2017/10/reclaimed-wood-dining-room-hutch-alternatives/. 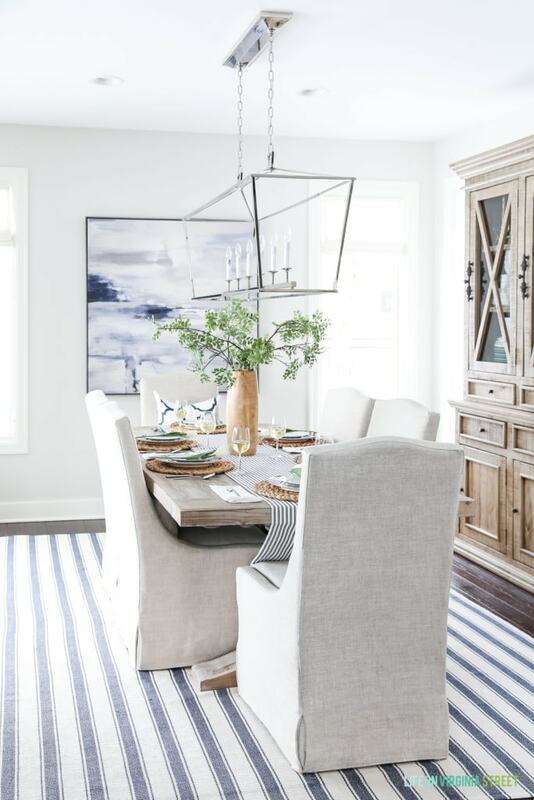 Very pretty….LOVE your dining room! I have always loved Blue & White!! I especially LOVE the art in the hallway from Home Goods! If you happen to run across it somewhere else, please share!